My name is Tom and I have hobby A.D.D. 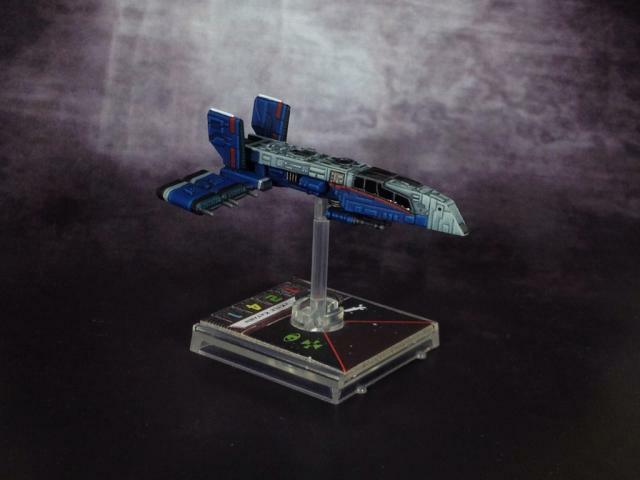 Following up on the last article on the myriad of new games, I would like to talk today about some of the things to keep in mind when you are painting models in a new scale. Let’s look at an example shall we? 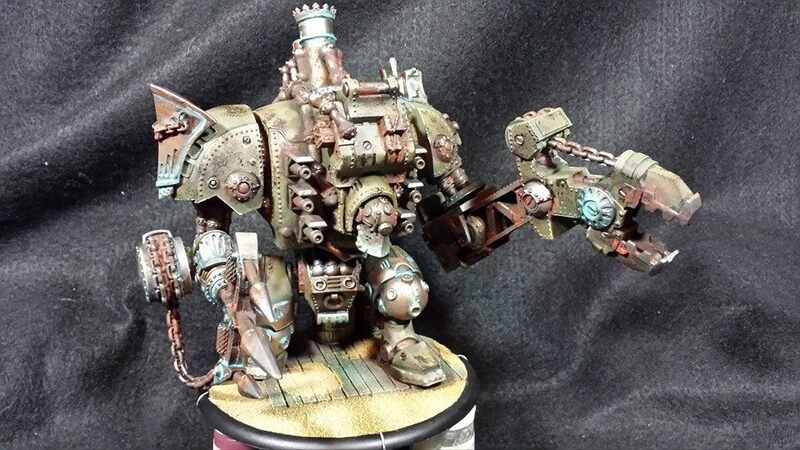 Tom is a miniature painter, and has been painting his Warhammer models for 15 years. He feels pretty comfortable with his skills as a painter and feels like he knows all of the tips and tricks to have a great looking army. His friend, let’s call him Mike, encourages him to buy some Dystopian Wars model. “Wow,” thinks Tom, “these models are really great!” So he runs out, buys some and takes them home to get covered and paint so that he can play some cool games with a fully painted fleet. Tom gets frustrated that many of the tricks he used to paint his Orcs do not translate well to painting these tiny French boats! He is so frustrated that he does not touch the models for months. Does this sound familiar? For those of you who have taken the plunge into some of the games outside of the 28mm comfort zone, you may have encountered similar issues. 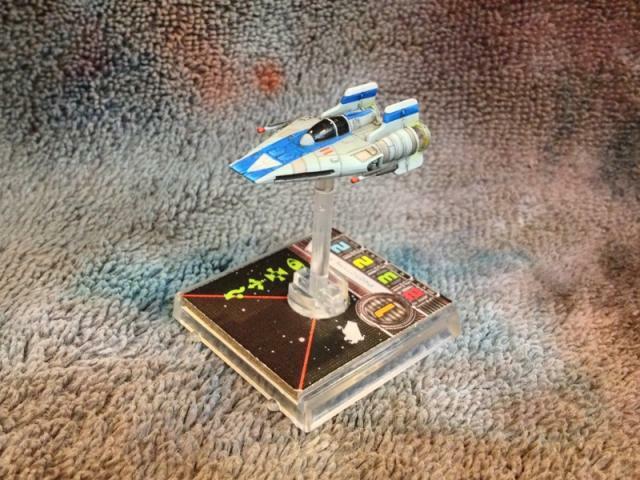 I have talked to some fellow hobbyists and compiled a list of tips and tricks for going from painting 28mm to those pesky 1:1250 scale boats or somewhat similarly sized space ships! Lange’s Directorate fleet. You can really see how solid clean colours in a carefully chosen scheme can look damn good! 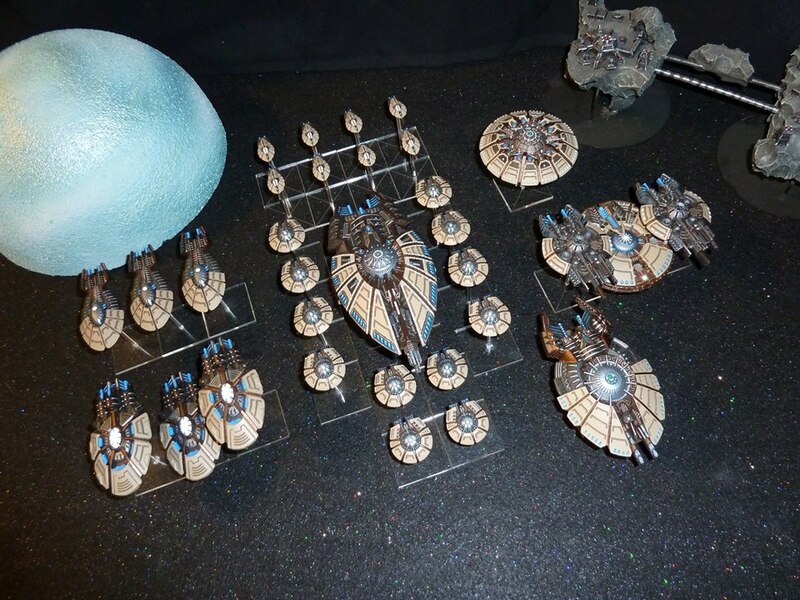 I am not the only person to think so as this fleet took Best Presentation at our last tournament! This really is a trap that many of us painters get into, sometimes we spend so much time working through difficult techniques that we forget some of the more basic questions such as, “do these colours look good together?” Mike Sawada, a local painter and member of our club elaborates further on the topic of colour selection, “try to pick high contrasting colours to separate the details.” He then goes on to suggest that you should, “go extreme with your highlights as well.” This is a big one, as it will really help to add more definition to your details. These guys really emphasize the importance of colour choice in scales like these. I think that the take home message from here is that you do not need to go crazy with dozens of layers or crazy techniques. Careful consideration of colours and fewer, more stark highlights will help make your models pop. 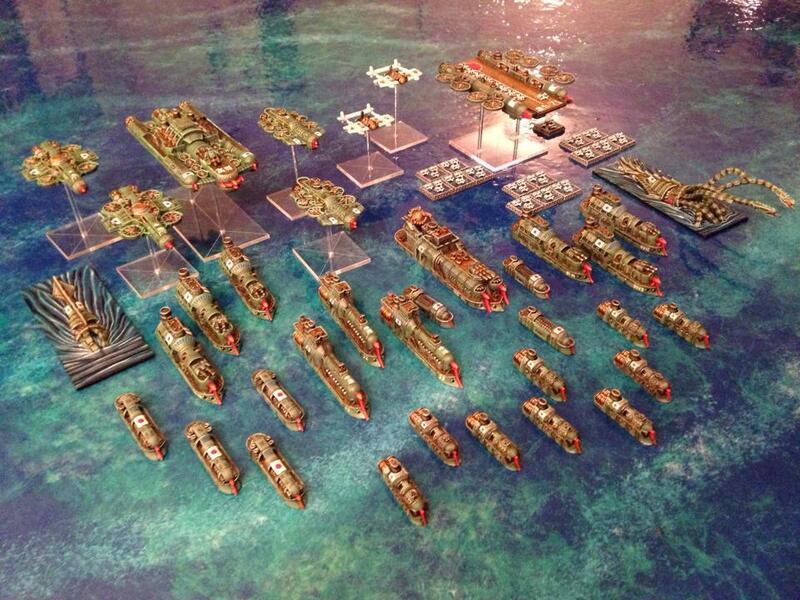 Mike’s Empire of the Blazing sun fleet is absolutely stunning. You will notice the high contrast between the red details and the green/grey hue of the hulls. 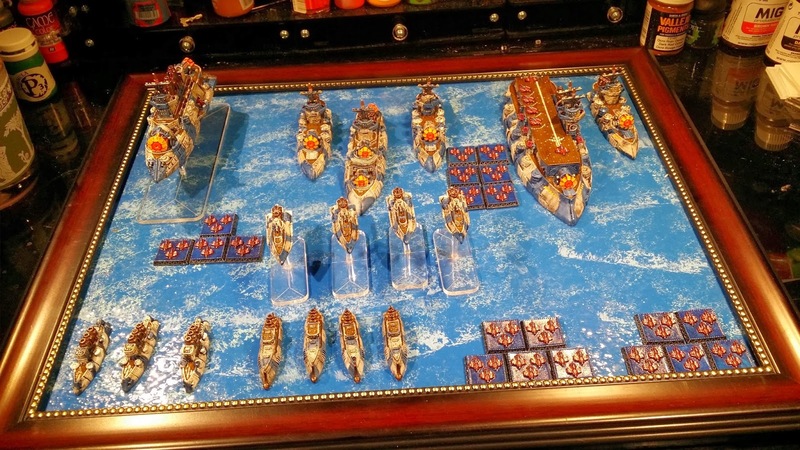 Adam’s beautiful Republique of France fleet. I particularly love how his display board is so damn classy! And he is right, while many advanced hobbyists may scorn the use of dry brushing, it often has the desired effect on these small scale models. This is especially when you just do not have the space to layer up through 10 steps and pick out all of the little details. One of Ward’s Ottoman ships. Wow. Just wow. This is a really interesting approach to painting these models. Funtionally, it means that you are amost always going to be starting out with a colour that is much lighter than the desired tone and work your way backwards through washes to get your desired effect. Almost the exact opposite way that we were all taught to paint our space marines! 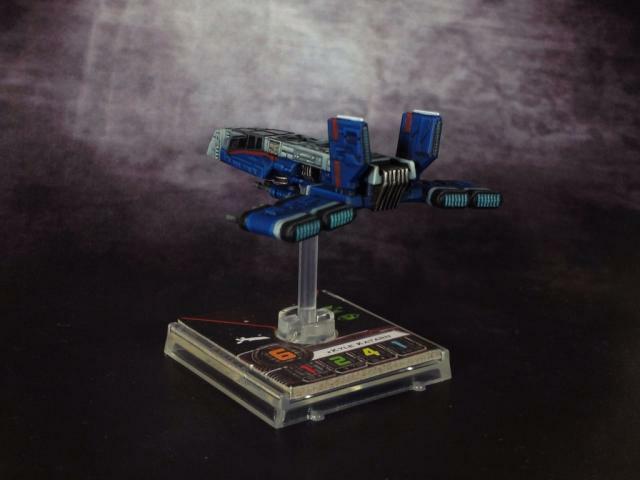 Nothing like making prepainted models look ten times better! It would probably be too easy to have all of the experts agree on how to paint small scale models. Some like more of an extreme highlight while others like their models painted much more subtly. Much of this is likely a function of each of their own unique styles of painting models that can be seen in any scale that they are painting. Very few painters will have models come out exactly the same way. Personal style aside, they do all agree that simplifying what you are doing is probably going to get you the best results. So whether you are planning on doing some OSL, freehand, weathering or anything else, remember that less is definitely going to be more. One of the things that I have learned is that certain weathering pigments or technical paints work better in different scales. For example, GW has released a really cool combination in the form of Typhus Corrosive and Ryza Rust. My initial impression of these two paints was pretty lackluster, but once you put the Typhus Corrosive on top of the Ryza Rust, it gives this really grimey effect and tones down the brightness of the Ryza Rust. The finished product is a thick and caked on dirty rust. I found that this worked amazingly well on my Galleon for Warmachine. I really wanted this guy to look like he was dragged behind a ship to save space. However, when I went to use the same thing on my French fleet for Dystopian wars, it made it look like the rust was about 4 feet high! 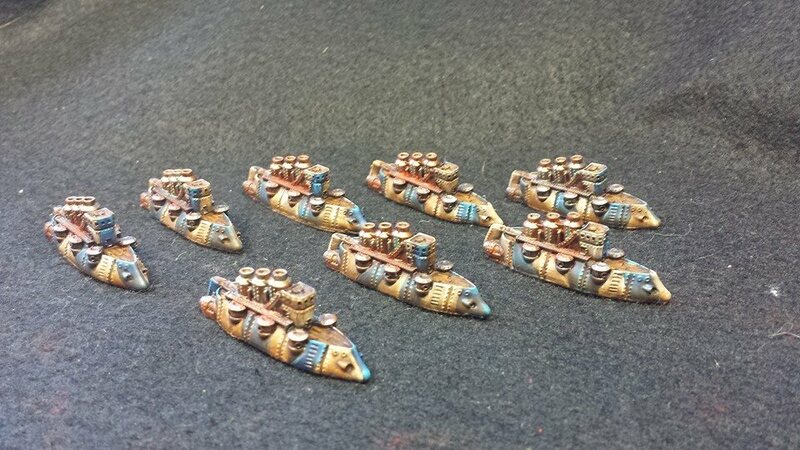 I decided to try out the rust powder from the Forgeworld weathering pigment set that I had picked up a while back. It turned out really well for achieving that look like the ships had been out at sea for a long time, not at the bottom of it. The smaller granule size for the texture meant that I had a ton more control over exactly how much was going on to the smaller ships. They also faded nicely after clear coating so that there was a much more subtle effect. As you can see from the picture above, the Galleon was meant to be anything but subtle. The French are dirty, but not THAT dirty. Thanks to all of the hobbyists who took the time to give me some advice on how to approach painting ships like those used in Dystopian Wars and Firestorm Armada. I hope you all found their insights as useful as I did. 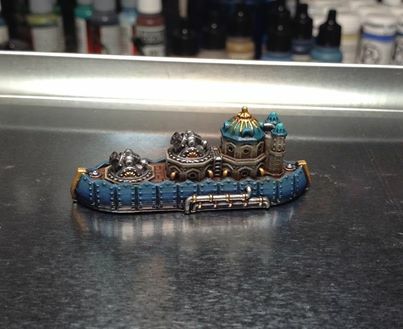 If you have any other advice for painting ships in this scale please feel free to let us know in the comments. I would love to see what you have to offer!